Demonstrates over 350 tried-and-true methods for guiding youth to read their Bibles, discover Bible facts, understand Bible meaning, & live Bible truth. - Publisher With Jesus as a guide, The Youth Worker's Guide to Creative Bible Study demonstrates tried and true methods for guiding youth to read their Bibles, discover Bible facts, understand Bible meaning and then live Bible truth. - Publisher Tried-and-true methods for encouraging today's youth to read their Bibles, discover biblical truths, understand the meaning of Scripture, then live a life based on Christian faith. 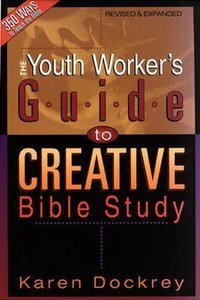 About "The Youth Worker's Guide to Creative Bible Study"
With Jesus as a guide, The Youth Worker's Guide to Creative Bible Study demonstrates tried and true methods for guiding youth to read their Bibles, discover Bible facts, understand Bible meaning and then live Bible truth. Tried-and-true methods for encouraging today's youth to read their Bibles, discover biblical truths, understand the meaning of Scripture, then live a life based on Christian faith. Karen Dockrey is a youth minister, writer, and mother who has walked through the teen years with hundreds of teenagers and their parents over the past thirty years. She holds the Master of Divinity degree from Southern Baptist Theological Seminary and has served two churches as minister to youth. Her books include "When a Hug Won't Fix the Hurt," the "Student Bible Dictionary," and "The Youth Worker's Guide to Creative Bible Study. "She lives with her husband and two children in Hendersonville, Tennessee.